Notching up a winning double at his first arena eventing fixture (May 20th) was Ben Davies who topped the junior beginner and progressive sections riding Mosstown Ronaldo (Ronnie). 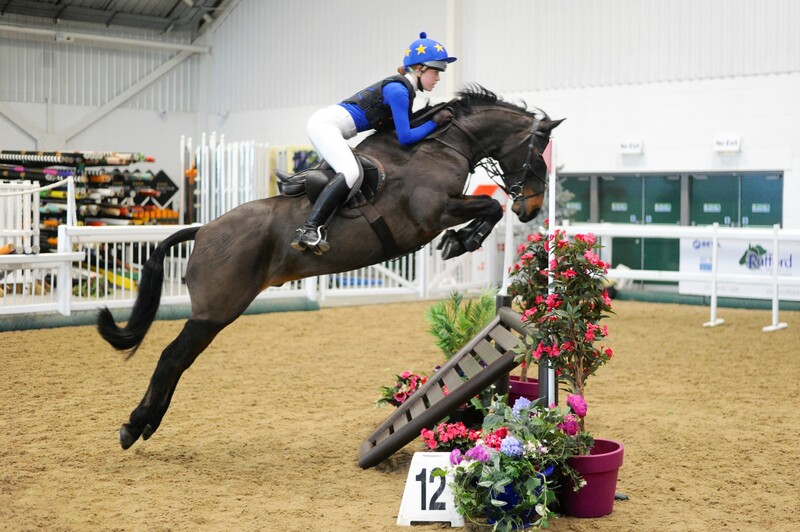 Ronnie had previously competed in working hunter, cross country and show jumping classes and after his purchase for Ben six months ago, the pair had gone well in their first show jumping classes, here at Aintree and Church Farm. However, an arena eventing winning double win was more than the 10-year-old rider had dared hope for. This was a careful course, but it all flowed with some nice turns and Ronnie loved it, especially the rustic oxer as he took that on really well. Ronnie tends to be quite speedy, so I have been trying not to let him rush into his fences and the main aim was to go clear,” said Ben. Lucy Postance was another junior rider celebrating a winning double as she timed her rounds to perfection to head the pre-intro 80cm and 90cm classes riding Brieryhill Matador (Matty). The Wirral rider has been riding Matty for the past 18-months and after competing in working hunter and local show-jumping classes, they are now ready to step up to affiliated jumping. “Matty has been the ideal schoolmaster and although he can be cheeky, he has taught me a lot and given me loads of confidence. We like coming to Aintree as the courses always challenge us and this was quite a tricky course with a decent arrowhead,” said Lucy, who enjoys lots of farm and beach rides. “We love to go for a blast on the beach with Dad (Dylan) and his horse,” added the Wirral rider. With no visible timing display, getting closest to the optimum time proved tricky for some riders, but after finishing second in the 90cm class riding Charlottes Diamond Web, Mark Grant upped the pace to win the senior pre-novice 1.0m section. “I realised I had gone a bit too steady in our first class, so I cut a bit tighter and went up a gear after that,” said Mark, who bought his seven-year-old mare, who is bred on King Of Diamonds lines from Gerty Tyran in Ireland 18 months ago. “I saw a video of her jumping and she looked as straight as a die. I knew she would be brave enough to jump anything and she rarely has a bad day. We enjoyed some arena eventing last year and we still have our British Show jumping (BS) British novice and Discovery second rounds to do,” said Mark. Shannon Roche was another timely rider, as she finished barely a stride over the optimum time to win the senior intro riding Muguet Des Moniers (Ralph). The Oldham rider bought Ralph seven years ago, the Selle Francais 18-year-old just coming back into competitive action after a colic operation and navicular and side-bone problems. “I’m just building him up again now and he feels great. We’ve had a couple of outings and although he can rush into jumps, arena eventing fences tend to back him off, so I can use my leg a bit more,” said Shannon. Having earned many BS successes in pony classes over the past four years, Alice Allen has opted to take The Irish Ranger (Harley) up into horse classes and on their first adult outing, the pair topped the senior pre-intro section. “With the arrowhead and road-closed, this was quite different to show-jumping. Harley is naturally quick, so I tried to slow him down a little bit and use the arena more,” said Alice, who had a mock exam the following day at Xaverian College, where she is working towards her A-levels in law, Phycology and English. Fiona Long and Tosca enjoyed a productive day here at Aintree, as they won the senior beginner class and finished third in the progressive section. Fiona bought her eight-year-old Connemara soon after he came across from Ireland to the stables where she liveried her hunter. “It all worked out, as when my horse retired, Tosca came up for sale,” explained Fiona. Tosca has certainly proved to be the ideal ‘pleasure pony’ as he has hunted with the Vale of Lune and Holcombe, attended Lucinda Green clinics and has proved his worth show-jumping. “He is as brave as a lion and loves arena eventing. The optimum time was hard to gauge, but the course is always interesting here and although there were plenty of twists and turns today, it flowed well,” said Fiona. Another Irish bred Connemara, Windmill Eclipse (Shamrock) proved a safe conveyance for his rider Wendy Hudson, the pair winning the senior progressive class. “The last arena event I did was two years ago and as I am not that brave, I hoped that if I pointed Shamrock at the fences and let him sort himself out, I would survive. He’s a natural jumper and although we did a wobbly corner to the ‘wavy planks’, everything worked out well,” said Wendy, who bought Shamrock just backed four years ago. Since then, the Gurteen Prince seven-year-old has successfully competed in dressage, working hunter and show jumping classes. There will also be a new points system for the 2018 shows with the highest point award going to the leading Horse/Pony/Rider who has attended all the shows. Horse/pony and rider combinations will be awarded points which will be accumulated at each show that they compete in. A leaderboard will be produced at each show with the overall winner announced at the end of the Autumn Show in October.